March 07. 2011 | By Valerie C.
Multi-instrumentalist Jason Robert Quever has found a new home at Sub Pop Records with the debut of his fourth album Fading Parade under his Papercuts moniker. The opening gentle guitar strums of “Do You Really Wanna Know” and Quever’s hushed tones indicate that this will be a pleasant musical journey. Follow up track “Do What You Will” with its hooky chorus and chilled out grooves invites us to just sit back and enjoy the ride. The rest of the record doesn’t deviate much from Papercuts formula of lo-fi, hush hazed melody making. Inserting strings and adding a pinch of organ harmonies here and there to give tracks like “Chills” a bit more depth. Yet, the journey starts to feel like a stroll with a few sparse moments of a brisk walking and back. 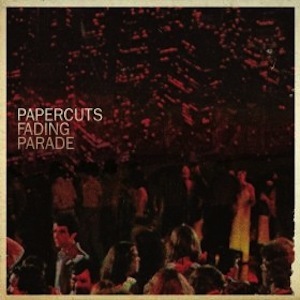 Fading Parade is a fuzzed filled indie pop trip that will keep you in an atmospheric trance. Following Quever’s hauntingly soft hushed voice and guitar picking like some pied piper. Only to wish that there were a few bumps along the way to make the journey much more memorable than it was.